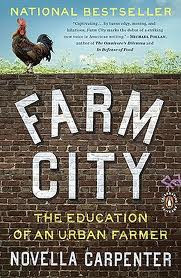 For Christmas this year, my thoughtful kid sister sent me Novella Carpenter's endearing and educational book, Farm City (Penguin, 2009). I devoured it from cover to cover in a matter of days. 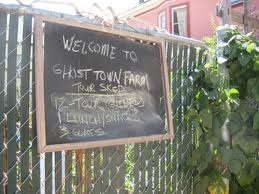 The book narrates Carpenter's experiences as an Urban Farmer, cultivating an abandoned lot next to her Oakland apartment, located in a sketchy area of the city known as "Ghost Town". The author adopts the name and characteristics of the neighborhood and applies them to her farm, which she describes in both the book and her blog. While mixing both literal root-down activism and information regarding the logistics of urban agriculture with metaphors of food as community and the universal among all living organisms, Novella Carpenter presents a story that is both heartfelt and heartwarming, as well as motivational for anyone interested in getting their hands dirty (and even bloody) by embracing their food source. For those of you already interested in urban gardening, I'll leave (and urge) you to pick up the book and learn along with Novella as she harvets squash and slaughters animals. For those of you that aren't yet interested in this topic, and especially for my Parisian readers, I'd like to point out the fact that food production in an urban environment is of inescapable importantance to every city dweller. 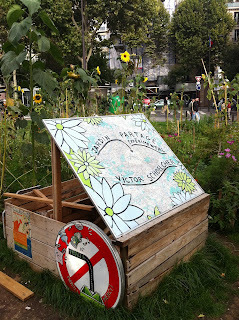 An article written by journalist and Slow Food France convivium member, Pascale Brevet, entitiled "Farms Flee the Cities: Can Paris and Milan Feed Themselves?" points out the fact that urban development along with the installation of Rungis the wholesale food market outside of Paris, has led to the city's depravation of local foods and an almost total dependence on "oil-fed transportation" or food that is brought in from the distant countryside. In the article, Brevet warns, "If the transportation systems were to fail, food would run out on supermarket shelves within days." Add to this scary reality the fact that it hasn't always been that way in Paris. Carpenter points out in her book that in 19th century Paris urban farms located in the Marais neighborhood "grew an annual total of 100,000 tons of vegetables". There is more encouraging news, as Carpenter recounts that cities where urban gardening thrives are capable of producing a large percentage of the vegetables eaten by their residents. "Shanghai" the author explains, "raises 85 percent of its vegetables within city limits" which leads to a much lesser risk of running out of resources, and running into empty store shelves. Obviously these days the Marais is occupied by overpriced clothings stores and restaurants and vacant plots of land are few and far between (thought they do exist, check out Day 51 for my article on community gardens in the 18th), making reaping a harvest of any sustainable proportions seem unlikely. So why even bother? Carpenter argues that these food yielding plots of land are not urban islands, but part of a larger whole writing, "Urban farms have to be added together in order to make a farm. So when I say I'm an urban 'farmer,' I'm depending on other urban farmers, too. 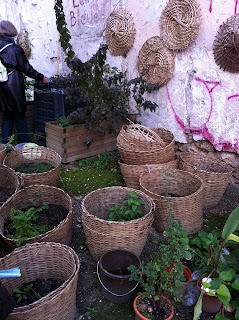 It's only with them that our backyards and squatted gardens add up to something significant." After reading Farm City I look at my little balcony garden differently, with the green sprouts of my black radishes and the lettuce seedlings that survived the sleet and snow existing as a part of a bigger picture, fitting in somewhere along with the rooftop bee hives at the Opera and, I hope, whatever you're thinking of growing this year.